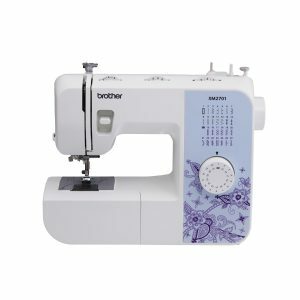 If you searching for a good Brother sewing machine, a machine that is light in weight, cheap and with lots of amazing features, the Brother XM2701 is a great choice. It is one of the best sewing machines for daily use as it comes with lots of accessories that make sewing easy. After trying out this machine, we will be providing our experience. Bear in mind, it is a great machine for beginners and anyone on a tight budget. It is a very light machine, ideal for people who want a machine that will not take up too much of their space. There is a beautiful floral placed where you choose your stitches. It comes with a cute minimalist design. One of the things we love about the Brother XM2701 is the lightness. 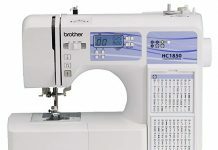 There are 27 built-in stitches that come with the Brother XM2701 sewing machine. The stitches range from the familiar basic ones ideal for most sewing projects, quilting and decorative stitches for other projects as well. The stitch can all be viewed right in front of the machine. It is located just on top of the stitch selector dial, and to select a stitch, all you have to do is turn a dial. 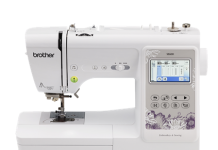 The Brother XM2701 comes with six sewing feet including buttonhole, blind stitch, button, and narrow hemmer. Whatever task you have at hand, brother has got you covered. There are also built in free arms that allow handling sew or hem sleeves without any hassle. Wasting time straining your eyes in a bid to thread the needle is now a thing of the past. While you might still have to learn the get the grasp of it, it is pretty straightforward. However, all that is required of you is to touch the lever by the side of the machine. This baby does all the hard work for you by guiding the thread through the needle. 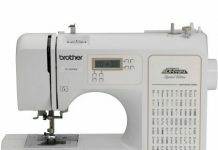 There is an automatic bobbin winding system alongside a top drop-in bobbin system which makes it all the more easy to use the Brother XM2701 sewing machine. Employing Brother’s Quick-Set technology, users can rest assured that the bobbin will stay in place during any job. Also, there is a bobbin control with which you can wind the automatically in just a few seconds. This feature gives you the ability to sew on weekends and late into the night. With this, you will not have to fret about a low light condition. Also, it gives you the ability to sew dark fabric easily. The LED light makes it very easy to get the job done regardless of the lighting condition. ii. We are pleased with the awesome collection of stitches featuring basic, decorative and quilting stitches. iii. The machine is just so easy to use. If you have never used a sewing machine before, there is the instructional DVD to guide you. iv. The instructional DVD also makes it easy to use. With this DVD, you get to see how to get started with the machine, removing any or all form of guesswork. This is better than just reading it on a page, right? vi. Making button is also a very easy task with the one-step, automatic buttonholer of the Brother XM2701 sewing machine. We found a couple of things Brother could improve on, in the Brother XM2701 sewing machine. One of the major complaints we had is that Brother XM2701 cannot effectively handle heavy duty fabrics like leather. I am not surprised as this is an entry-level machine not really designed for this job. There are other machines well suited for that. All in all, the Brother XM2701 sewing machine can handle most projects easily. You can have a terrific time sewing. It is light, portable, and pretty easy to use. This brother sewing machine offers amazing features compared to similar models with the same price tag. It is a great choice for beginners, but experts might want to go for something bigger. Also, brother is a reliable brand in the sewing machine industry so you get great warranty, if something goes wrong.